YEMA (Ambre) - Master Elements Limited Edition Chronograph water-resistant to 300 meters. Stainless steel 316L case. Screwed crowns and pushers with double-gaskets. Carbon fibre dial. Luminous hands and index. Steel tachymeter scale, black plating. Steel rotating bezel, black plating. Calfskin and carbon look leather strap with deployment buckle. ETA 7750 automatic movement. Hours, minutes, small second, stop-second device. Chronograph 60 seconds. 25 jewels. 38 companies – representing some 80 brands – make up the French delegation to BaselWorld 2009, including 18 in the watchand clock industry (halls 1.0, 1.1, 2.0, 4.1, 5.0, 5.1 and 3.U) and 20 in jewellery, high jewellery, gems and pearls (halls 2.0, 2.1, 2.2, 3.0, 3.1, 3.2 and Palace). Know-how, perfection of execution, elegance of the details and wealth of materials form the specificity and tradition of French watch, jewellery and high jewellery manufacturing. Creativity, quality and variety are the strong points in these new collections which, in reaction to the ambient gloom, focus on gentleness, charm and seduction. 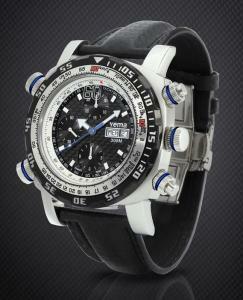 For city wear, evening wear, sports or leisure time, watches come in highly varied styles, adapted to each activity. In cases, the round shape is popular along with the square or rectangle and, to a lesser extent, barrel, oval and even side shifted shapes. Dials are calming down, displaying only hour-symbols, figures or finely decorated with narrow stripes, discreet patterns. New finish techniques (PVD, IP) soften the total black look which is still a major theme (case, strap and dial), using touches of colour. Black is also combined with white (steel, lacquer, ….) whilst gold plating, gold (yellow and, above all, pink) and silvered metal are enjoying renewed success. Diamonds, gemstones or synthetic gems remain fashionable set onto cases, dials and straps. Leather, skin or synthetic straps are making a big comeback. Metal design are varied in terms of style or shape, adorned with a variety of patterns and sometimes combined with leather. Men’s watches come in extra-wide sizes, sometimes oversize and in dark colours, mainly black. Chronographs, automatic, multi-function models or with complications are very popular. Urban-chic style is seeing renewed success with ultra-flat, sober and elegant designs. For ladies, the fashion is for designs more adapted to feminine wrists, in delicate, elegant lines: metallic case-strap sets come with links or bows, rigid reeds, thin straps ors multi-lace watchstraps, cuff-watches finely decorated with a variety of patterns (flowers, butterflies, …), jewel-watches. In addition to black, which is also fashionable, black and white, white and pastel shades are in the majority. The trend is towards softness with rounded shapes in jewellery-high jewellery (links, disks, waves, metal or crystal balls, pearls), with lightness and transparency effects (open-worked jewellery, lace patterns, links, filigree). Large designs are seen alongside extra-dainty pieces. Plays on contrasts (matt-shiny, polished-satin or sand finish), oppositions of materials, mixtures of colours and materials are very important. The white metal and diamonds combination retains many fans but gold comes in lots of different colours too: yellow and, above all, pink as well as, more recently, green gold. Gemstones in a variety of shapes – cabochon, facetted, twisted, briolettes, pyramids, pears – choose shades of pastel or harmonized colours or, on the contrary, combinations of bright colours. Red, in every shade, from pale pink to deep violet, is amongst the star colours this season, with a special mention for rubies, which are being rejuvenated. Pearls and mother of pearl, particularly black, are also very fashionable. Tie-necklaces, long and fine-chain necklaces set with a variety of patterns or beads made from different materials, chains with pendants or charms as well as multi-link necklaces made from chain of different sizes, colours and shapes are particularly highlighted. Rings are opulent: wide engraved rings, big central stones surrounded by ribbons set with diamonds, precious or semi-precious gems, large solid or open-worked settings, decorated with gem-set patterns…. Simple shank, wide or narrow link chains decorated with charms, several rows of small chains, wide rigid cuffs engraved or richly set with gems, bracelets come in a wide range of designs. Long and hanging, hoops, studs and sleepers, earrings come in a variety of styles too. Men’s jewellery is also the object of particular attention with ranges ceaselessly renewed in terms of designs that are adapted to or inspired by their passions. Cufflinks are back, in more modern style. Watches are fascinating... Stay up to date with the latest from WatchPaper!